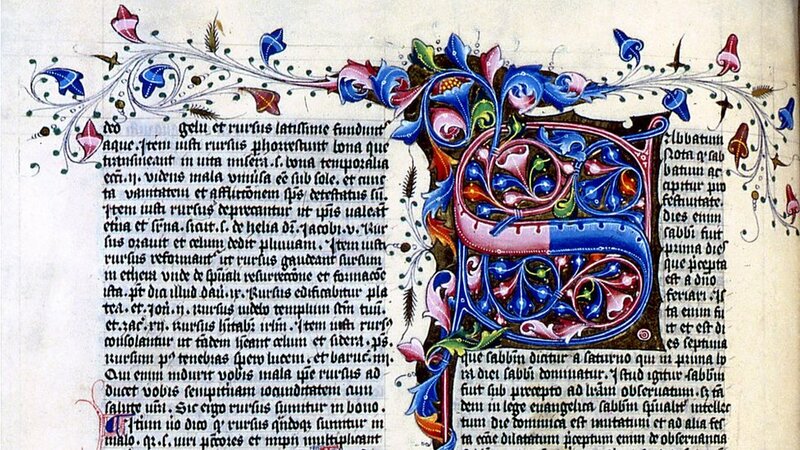 BBC Religion & Ethics - In pictures: What is an illuminated manuscript? 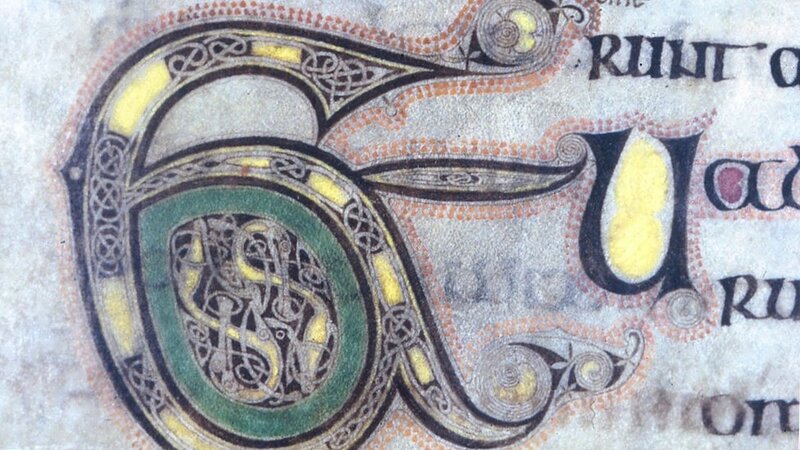 In pictures: What is an illuminated manuscript? The term ‘manuscript’ comes from the Latin for ‘handwritten’. Before the invention of printing all books were written out by hand. 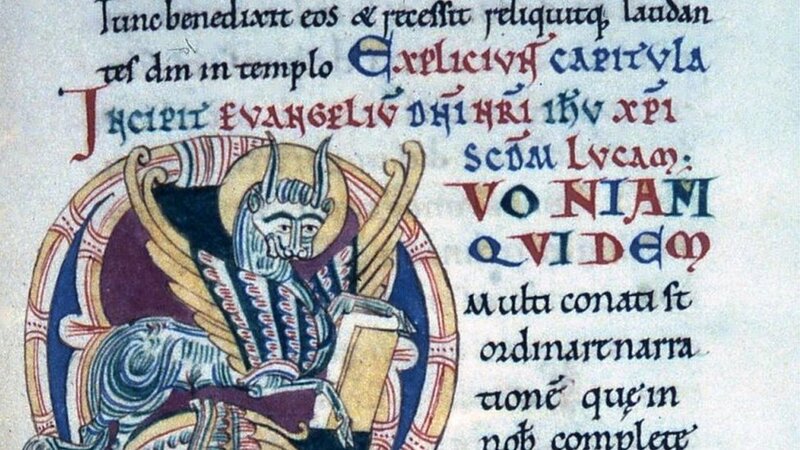 Some manuscripts were made more precious by illumination (from the Latin word for ‘lit up’), which took the form of decorated letters, borders, and independent painted scenes. This picture shows the oldest manuscript in Durham Cathedral Library, the earliest Latin witness to the Book of Maccabees. 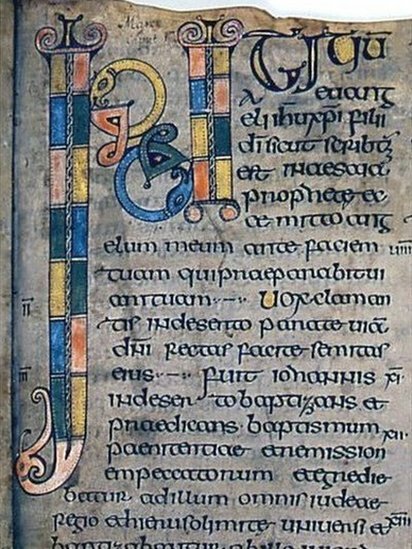 The only decoration on this page is a small fish forming the left leg of the initial ‘A’ in the second column. Many capitals within the text of this 7th Century manuscript, the oldest decorated gospel-book from the British Isles, are highlighted by red and yellow. The text of the Gospel of St. Mark has a large decorated opening capital, with groups of spirals in trumpet patterns as well as animal ornament. The Durham Gospels is a masterpiece of early Northumbrian book-craft and illumination. 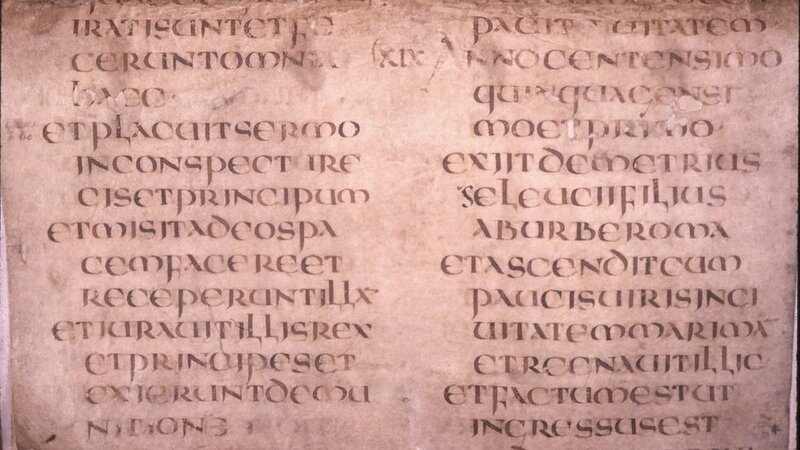 Important passages within this 8th Century gospel-book are highlighted with decorated initials and capitals, and many individual sentences start with letters emblazoned with yellow, purple and green and outlined with red dots. The manuscript commentary on the Psalms contains two full-page miniatures of King David, marking the division of the Psalms. The full-page figure of David does not illustrate the text but is the image of Christ. The illumination also shows the triumph over evil, with David trampling on the body of a two-headed snake. In Norman manuscripts such as this one, ornament is mainly confined to initials, using bright colours including red and green. The initials are often inhabited by men or monsters, or enriched by foliage. Great bibles such as this were common in large ecclesiastical centres and a source of some pride to their communities. 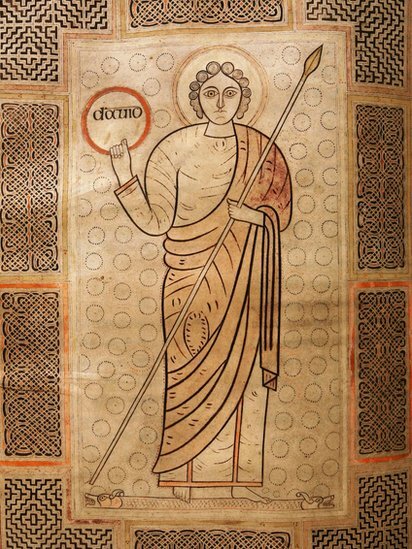 In this 11th Century Bible from Saint-Calais, Normandy, St. Luke’s Gospel opens with the symbol of St. Luke, the winged calf holding a book between his forelegs. 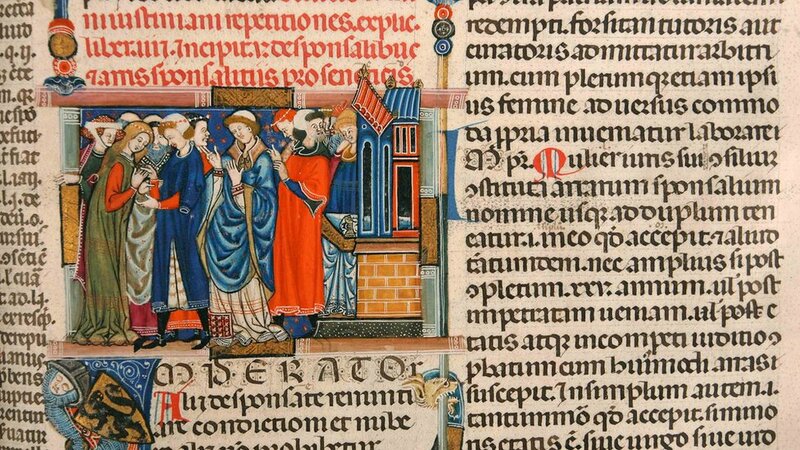 A historiated initial is a letter containing an identifiable scene or figures, sometimes relating to the text. It was a popular feature of medieval illumination. 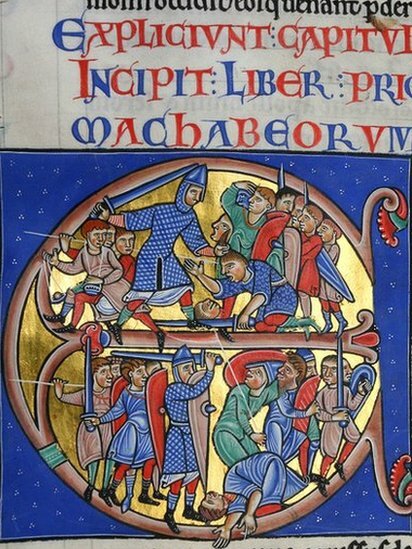 The historiated 'E' at the beginning of I Maccabees shows a man being executed for refusing to worship idols, and one of the many battles which occurred during the Maccabees' reign. 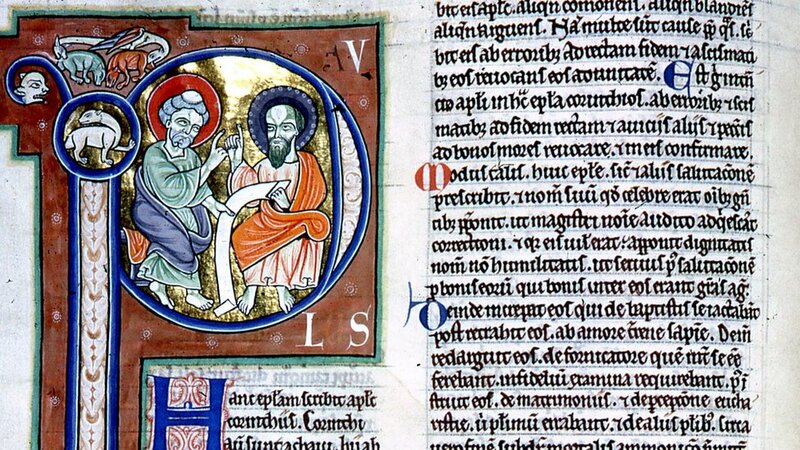 From the Le Puiset Bible, one of the masterpieces of 12th Century English book production. In this manuscript from Northern France, magnificent gold-adorned initials mark the preface and start of each commentary on St. Paul’s Epistles. The opening to the First Epistle of St. Paul to the Corinthians shows the seated figure of St. Paul with Sosthenes (the president of the synagogue in Corinth), both holding the same scroll. In this Italian law manuscript, one-column miniatures mark the opening of each book and each title has an illuminated initial both to main text and commentary. The frontispiece to Book V, ‘On Betrothals and Marriage’ depicts a wedding, with the groom placing a ring on the finger of his bride. In this alphabetized collection of thousands of Latin words, each letter of the alphabet opens with a glorious decorated initial, with border decoration flowing across the page: tendrils of ivy leaves and flowers in red, blue, pink, and lots of gold. 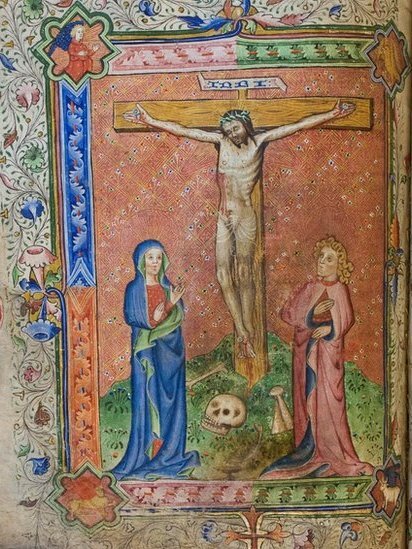 This full-page image of the Crucifixion marks the beginning of the Canon of the Mass, the prayers said by the priest as bread and wine are ritually transformed into the body and blood of Christ. The image of the cross is damaged from being kissed by the officiating priest at the opening of the Canon of the Mass.